Jane Safety Mattress for the Jane Micro Carrycot. Specially made to fit the Micro carrycot range by Jane. This mattresses is light, breathable and fits snugly inside your Micro carrycot to provide a soft comfortable place for your baby to sleep. 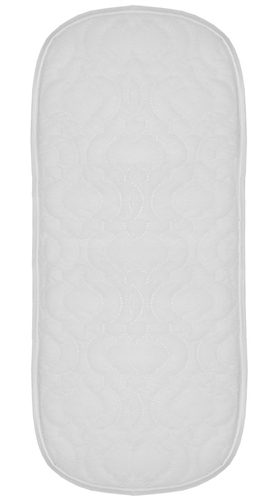 Has a removable washable cover that's made from a specially breathable quilted polyester material. Bought as recommended for carrycot Micro. Soft and nice. Size suits carrycot ideally. What is the difference between the original mattress and the safety mattress? Is the safety one for a specific purpose? Jane UK Replies: This mattress is breathable and has a cover which is removable and washable. The original mattress included with most prams today are more of a day mattress. It’s considered good practice to have a mattress for overnight sleeping and a different one for day use. It also means you have one always ready as one is aired and / or washed. Do I need to remove the original matress prior to installation, or does it simply fit on top ? ?